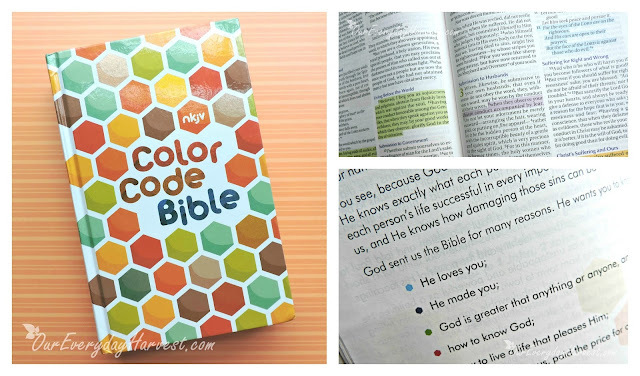 Color coding scripture as part of a Bible study is very common these days. To be honest, it really is a great idea. At the same time, I'm always worried that I'm going to ruin my Bible by using the wrong highlighters and risk ink running through its fragile pages. 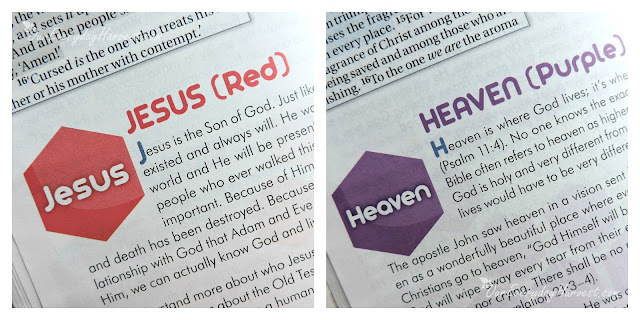 Perhaps that's why I'm really liking the newly released NKJV Color Code Bible! Full of bright colors, memorization aids, and the never-ending truth of God’s Good News, the Color Code Bible is an exciting new way to study God’s Word. Over 1600 passages are color-coded on important faith themes. The first New King James Version for Kids highlighted in full-color, this Bible will be simple for kids to read and understand. The NKJV Color Code Bible was for created for children in mind (ages 6 through 10), but to be honest it's a Bible that's fitting for just about anyone, even teens and adults. The translation is perfect for those who are just beginning the Bible, as well as seasoned readers. 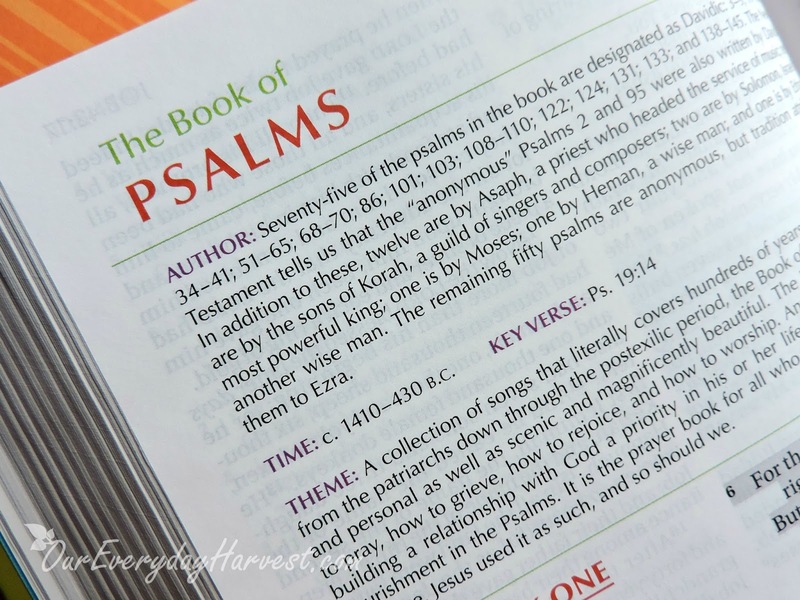 It stays true to the original King James Version, but offers more updated, easy to follow text. The many reasons as to why reading the Bible is so important. There is a special guide that's included in the beginning of the Bible that allows readers to dig deeper into the significance of each color that was chosen. I especially like the highlighted scripture index that's included. It actually lists each scripture from the Old and New Testaments and is broken down by theme/color. The only thing that I would change is the vibrancy of the highlighted verses. Some of the colors work well and are pretty prominent at catching my eye, while others almost don't stick out as much. My guess is that the pastel color approach makes the text easier to read, so it's a small sacrifice for the better I suppose. Nonetheless, this is a really great Bible for children and adults who are looking for one that already does the work for you, showcasing some of the more important themes throughout. Not only am I happy to be sharing my review of this new Bible, but I'm also giving away a copy! 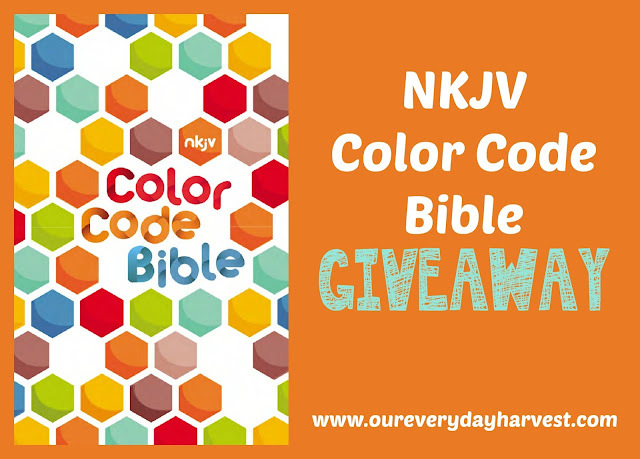 You can enter for your chance to win the NKJV Color Code Bible by following the Rafflecopter prompts, below. I've also included plenty of extra ways to enter!